Recommend.my is a place to find the best services professionals in Malaysia. We find reliable contractors to respond to your requirements. We help ensure they deliver quality work. We provide insurance coverage in case the project has a problem. When you are interested to hire one of them, you can book them for a meeting (your number will be shown to them). When you have agreed on a final price, you can pay Recommend, and we will do partial payment to the pro (think of it as paying an up-front deposit). When you are happy with the work, you can release the balance to the pro. 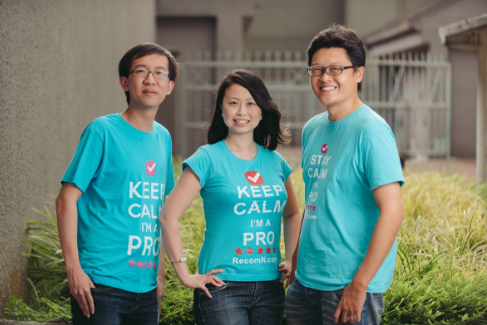 Recommend.my is simply a better way to hire the best service pros in Malaysia. From left: Anthony Wijaya, Jes Min Lua, Alex Tan. Jes Min started her career in Accenture, where her first boss (with a lot of foresight, come to think about it) taught her the joys of coding on obsolete green-screen type machines. She quickly realised her love for crafting strategies and business models to help companies grow fast and furious, and hopped to Bain & Company to do even more of those. Craving something different, she went to do an MBA in INSEAD, a life-changing experience that embedded in her the seed of entrepreneurship, creating social impact, and the desire to live on the brink of I-don’t-know-what-tomorrow-brings-but-bring-it-on! Alex has been a Microsoft developer, marketing consultant, and content director. When a broken shower heater resulted in a bad experience with a plumber, he turned his attention to fixing the inefficiencies of service professional searches, instead of learning how to fix shower heaters himself. To him, everything is a system just waiting to be optimised. This “life can always be hacked” attitude, combined with an abundance of laziness means that he will always try to find the most efficient way of doing things, so that he can get back to watching Game of Thrones. Anthony looks after Sejasa.com (our operations in Indonesia). He was formerly in Lazada and other fast-paced eCommerce startups, responsible for growth and performance marketing. He quickly realized the inefficiency in the service industry when he struggled to find someone to repair the aircon in his apartment. His long term goal is to transform the service industry so that hiring service professionals online is as seamless as buying products online. In his free time, you can find him online playing DOTA2.